I suppose that if you were to ask most people about traditional Japanese culture, they would talk about geishas and samurai, sushi, kimonos and bonsai trees. 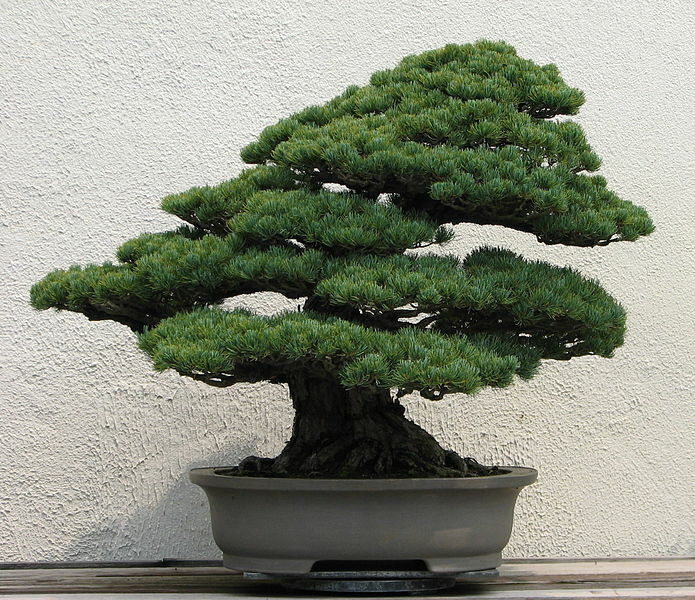 It’s likely though that few people would know much about the bonsai tree and probably would not have seen one. 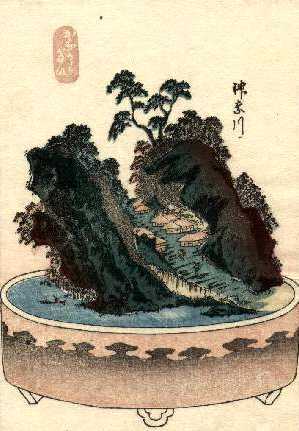 In many ways, however, the bonsai is a very good illustration of Japanese cultural concerns… its roots are in zen – the contemplation of nature – but primarily it is an art form that is about controlling nature, packaging nature if you like and this fits very well with the traditional Japanese psyche. The word comes from bon meaning a tray and sai meaning planting. The oldest known bonsai tree is 500 years old and is in the Tokyo Imperial Palace; incredibly there is a record of it being cultivated in 1610 by Tokugawa lemitsu. The hobby is quite popular here in the UK; there is a thriving amateur bonsai market and many people practising with these tiny apparitions of wild nature… these worlds contained. But what of their history and what of their place in art… how and why are they represented? When we talk of the Japanese aesthetic, we seem to come back to the fundamental principle, the untranslatable phrase – wabi-sabi. This Buddhist based philosophical pose lies at the heart of all Japanese appreciation and culture. Put crudely, it is a position based on the Buddha’s insistence on impermanence, imperfection, transience and the integrity of natural objects. Wabi refers to the loneliness of living in nature, sabi from the patina of age – quite literally withered. Maybe in the west, it is the spontaneous feeling that people experience when seeing a ramshackle, half-timbered house in a country lane. It is an aesthetic of melancholy, contemplation and of nature. Clearly, the gnarled and withered roots and twisting branches of an old bonsai achieve this objective; and this sparseness, this suffering if you like, (so essential to the arts of the Japanese) has been a part of Japanese society for thousands of years. Bonsai rarely take a starring role in Japanese prints, but they are not uncommon in supporting roles. 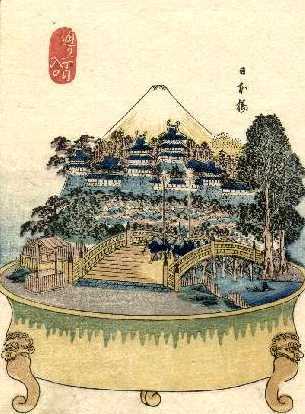 Possibly the favoured ukiyo-e for the bonsai enthusiast is a series of Tokaido Road prints entirely based on miniature bonsai landscapes – each potted tree representing one station on the great Tokaido. The Tokaido Road was the route between Edo and Kyoto, made famous outside Japan by Hiroshige’s lifelong devotion to picturing each of its 53 post stations in an individual print. The craze for Tokaido series became very popular amongst woodblock artists during the middle of the nineteenth century. It was a brilliant and very clever deviation from the usual theme when Yoshishige, in 1848, chose to depict the entire route in this unconventional way. The prints themselves are among my favourite landscapes in ukiyo-e. They are wittily and superbly realised and retain some recognisable features from the Hiroshige that they use as their model. Ukiyo-e enthusiasts will be familiar with the novel, (often credited with being the first of its kind) Utsobo Monogatari (the Tale of the Hollow Tree), from 970. This includes this passage on the cultivation of miniature trees: “A tree that is left growing in its natural state is a crude thing. It is only when it is kept close to human beings who fashion it with loving care that its shape and style acquire the ability to move one.” This seems to sum up the entire outlook of Japanese aesthetics from ceramics to screens, from the tea ceremony to much of ukiyo-e. Later, in 1383 we find the Noh play Hachi-No-Ki (The Potted Trees) which tells the story of an impoverished samurai and his bonsai. A shogun, Tokiyori, travels the winter landscape in disguise and calls at the house of a poor samurai who has lost everything except his three treasured bonsai trees. Nevertheless and not knowing the king’s identity, he chops up the trees to make a fire for his guest and promises his loyalty to the king in time of crisis. Later when the king calls for soldiers the old samurai turns up and the king rewards him with three provinces – one for each of his trees – plum, pine and cherry. Above is a very fine print of the subject by Kuniyoshi from the fabulous album A Comparison of the Ogura One Hundred Poets. King Tokiyori is present in the print, seated in grey robes whose pigments have oxidised delightfully. In the top right of the picture is the old samurai’s armour hanging from a chest. In front of Tokiyori is a small fire in a hearth and at the base of the image are the broken bonsai. The story (and the subsequent print) tells us much about the importance of bonsai cultivation. It illustrates the devotion of the poor samurai who has lost everything but his trees, the acknowledged sacrifice of these venerated items and the recognition of his devotion by the Shogun. The nineteenth century saw an enthusiasm for bonsai akin to the tulipomania in Holland of the eighteenth century. In another print by Kuniyoshi we see a woman negotiating a discount on some potted trees with an inset picture of lumber yards in the background. Elsewhere, bonsai appear in print series with titles such as A Collection of Desires. The bonsai is embedded deep in the folk stories, histories, philosophies and dramas of Japanese culture and their occurrence in woodblock prints underscores this importance as the many other examples by Kunisada, Yoshitoshi and Hiroshige attest. This entry was posted in Bonsai, Japanese Art, japanese woodblock prints, Kunisada, Kuniyoshi, ukiyo-e art, Uncategorized, yoshitoshi and tagged Bonsai, Japanese prints, Japanese Woodblock Prints, Kunisada, kuniyoshi, Tokaido Road, Toshidama Gallery, Ukiyo-e, wabi-sabi, Yoshitoshi. Bookmark the permalink. I just loved this post!!! Working on one right now about battledores and using lots of ukiyo-e examples.